Last time I discussed the evolutionary viewpoint behind the IAU’s decision to move Pluto from being a “planet” to a “dwarf planet.” I also noted that as a Biblical creationist, I reject the naturalistic explanations given for the origin of the solar system and instead accept the supernatural explanation given in the Bible. Therefore, I look for design in the universe; and from the ordered design I observe, I will then give my viewpoint concerning Pluto’s planetary status. However, in this article I will be setting the stage by discussing some of the foundational evidence for design in the solar system. The Bible states in Gen 1:16-19, “16Then God made two great lights: the greater light to rule the day, and the lesser light to rule the night. He made the stars also. 17God set them in the firmament of the heavens to give light on the earth, 18and to rule over the day and over the night, and to divide the light from the darkness. And God saw that it was good. 19So the evening and the morning were the fourth day.” Clearly, God is using for us the language of appearance. 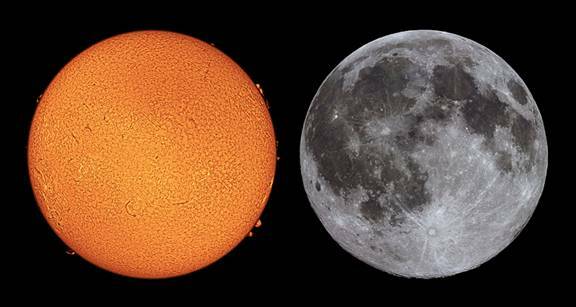 The moon is a light via reflection and it is just a speck in comparison to the actual size of the sun (more than 27 million times more massive) and other stars. Yet, from our viewpoint they are visibly the “two great lights” and of the same size, the sun is clearly “the greater light to rule the day” in the same way the moon is “the lesser light to rule the night.” Additionally, this extraordinary relationship is also what is required to give observers on earth both solar and lunar eclipses. All other luminaries from our viewpoint are just small points in the sky compared to our view of these two dominant and uniquely created lights. This precisely created sun-earth-moon size/distance relationship must remain a very strange coincidence for the evolutionist, but stands right in line with what would be expected from the Biblical creationist. I hope you will join me next time as the evidence for design gets even better as we move farther out in our solar system. Stay tuned, eventually I will make the argument from the design in our solar system whether or not Pluto should be considered a planet. Don DeYoung and John Whitcomb, Our Created Moon (Green Forest, AR: Master Books, 2003), p. 20.